ENRIQUE DUSSEL, was born December 24, 1934 in the town of La Paz, in the region of Mendoza, Argentina. He first came to Mexico in 1975 as a political exile and is currently a Mexican citizen, Professor in the Department of Philosophy at the Iztapalapa campus of the Universidad Autónoma Metropolitana (Autonomous Metropolitan University, UAM) and also teaches courses at the Universidad Nacional Autónoma de México (National Autonomous University of Mexico, UNAM). He has an undergraduate degree in Philosophy (from the Universidad Nacional de Cuyo/National University of Cuyo in Mendoza, Argentina), a Doctorate from the Complutense University of Madrid, a Doctorate in History from the Sorbonne in Paris, and an undergraduate degree in Theology obtained through studies in Paris and Münster. 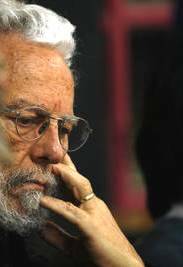 He has been awarded Doctorates Honoris Causa from the University of Friburg in Switzerland, the University of San Andrés in Bolivia, the University of Buenos Aires in Argentina, the University of Santo Tomás de Aquino in Colombia, and the National University of General San Martin in Argentina. He is the founder with others of the movement referred to as the Philosophy of Liberation, and his work is concentrated in the field of Ethics and Political Philosophy.